Sts. Elizabeth and Zachariah were the parents of John the Baptist. She was a relative of Mary the Mother of God; no one knows the exact biological relationship between them, but tradition often says that they were cousins. The Gospel of Luke states that though Elizabeth had committed no evil in the eyes of God, she was barren for most of her life. She was advanced in age when the Angel Gabriel appeared to her husband Zachariah in the temple to promise them a son. 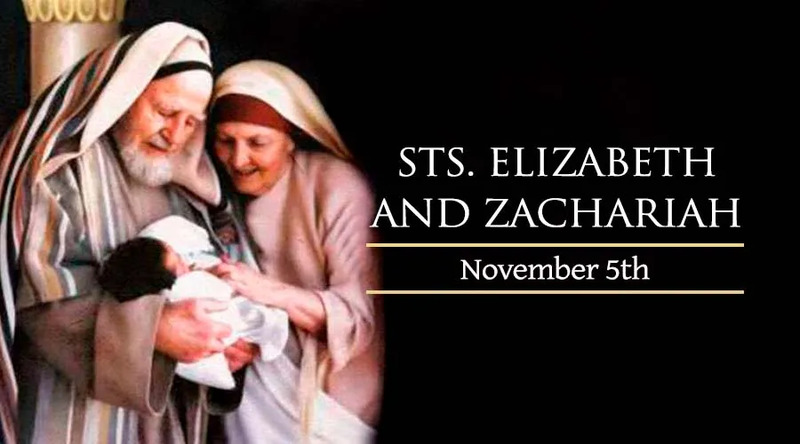 St. Elizabeth is most famous for the words of the “Hail Mary,” which she uttered at feeling her child leap in her womb as Mary, then pregnant with Jesus, came to visit cousin. However, there is no further mention of her in the bible after the birth and circumcision of her son John the Baptist. Zachariah was in the Temple when the angel Gabriel appeared announcing that Elizabeth would bear a son who would "bring back many of the people of Israel to the Lord their God." When Zachariah expressed doubt at this because of her age, he was struck mute, and upon exiting the Temple it was clear to the people there that he had seen a vision. He remained mute until John's birth, when he wrote out the newborn's name.